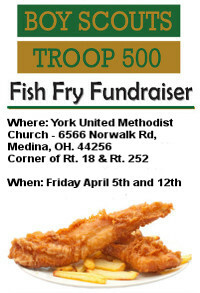 York United Methodist Church is the home Troop 500. The church is our central meeting place located at the corner of Columbia Rd. & SR 18. Unless otherwise specified, this is where the majority of our troop meetings take place. We would like to thank YUMC for your continued support over the years and providing us with a great place to meet as a group and grow together as a Troop.